I have some ideas and tips to share on how to decorate a vintage ballerina nursery for a baby girl without spending a lot of money! The decorating ideas that I have to share didn't cost a bundle. I am very pleased with the effect of the pink and green color scheme of the room and the results. The baby bedding that was chosen was purchased online for just $80. When the ballerina baby bedding was chosen all we had to do was follow the color scheme that was already laid out for us in the fabric. The set that we chose inspired a pink and green nursery for our project. The damask pattern that you see above the wooden chair rail was painted using a reusable damask stencil pattern. The designs were painted using a pretty pink paint color and did a lovely job of making the walls of the vintage ballerina nursery fresh and interesting yet just the slightest bit old-fashioned. The metal of the 4 arm chandelier had a rich, timeless patina that made it worth having it re-wired. Nothing more was needed other than antique white mini-shades and a wreath of dried pink roses. 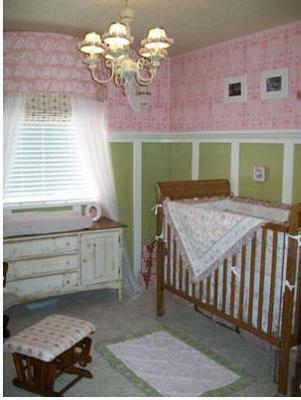 The roses added color that matched the crib set beautifully and gave it a Victorian look. It does its job of directing the gaze of our visitors so well that nearly everyone that enters the room comments on the light fixture before they admire our baby! Rather than buying cutesy, modern ballet themed artwork I chose Edgar Degas prints instead. I felt these prints were more in keeping with our vintage ballerina nursery theme and that our daughter wouldn't outgrow them as quickly. The baby's dresser may have originally been bright painted bright white. After having been passed from family member to family member, the paint is now a creamy, aged color that has been naturally distressed and when I replaced the painted wooden knobs with pink crystal drawer pulls it really came to life. I found fabric that matched the baby bedding and made my own Roman Shades for the windows and reupholstered the rocking chair's stool with the same fabric. I hope that the tour of our baby girl's nursery will inspire other moms that visit Unique Baby Gear Ideasto use their imaginations and create something new and different even if they have to use old stuff to get the look they want. This is the perfect theme for me. I have a pair of my mom's ballet slippers that are framed in a shadowbox. I have bought an antique, French dress form to use to display her tutu for awhile, at least until my daughter reaches the toddler stage when many things will need to be put away for her safety. Join in and write your own page! It's easy to do. How? Simply click here to return to BALLERINA NURSERY PICTURES and IDEAS.